Beautiful Russian girl Anastasia Yankova (born on March 1, 1991 in Moscow) is a winner of the Cup of Russia in Thai boxing and Kyokushinkai karate. Besides, she is a fashion designer, and a model. Currently, she is studying in International Slavic Institute to become the designer of clothes. However, even in her alma mater, the institute few people realize that she is one of the leaders of female Thai boxing in Russia. In particular, on March 2011 she became the winner of the Cup of Russia in Thai boxing. 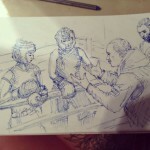 According to the Russian Thai boxing champ, she has only male sparring partners. And she fears neither pain nor injury while still managing to maintain both – beauty and femininity.